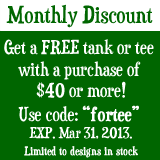 To redeem the March 2013 newsletter discount, you must place the shirt you’d like into your cart and, before checking out, enter “fortee” as the discount code. So click on the WTSB Shop tab above and get shopping! Please note: I do my best to keep the t-shirt and tank top inventory up-to-date. If for some reason you select a shirt that hasn’t been updated as out of stock, I will contact you to determine what you’d like instead.